RFFI has conducted extensive forest and watershed restoration in the Usal Redwood Forest. 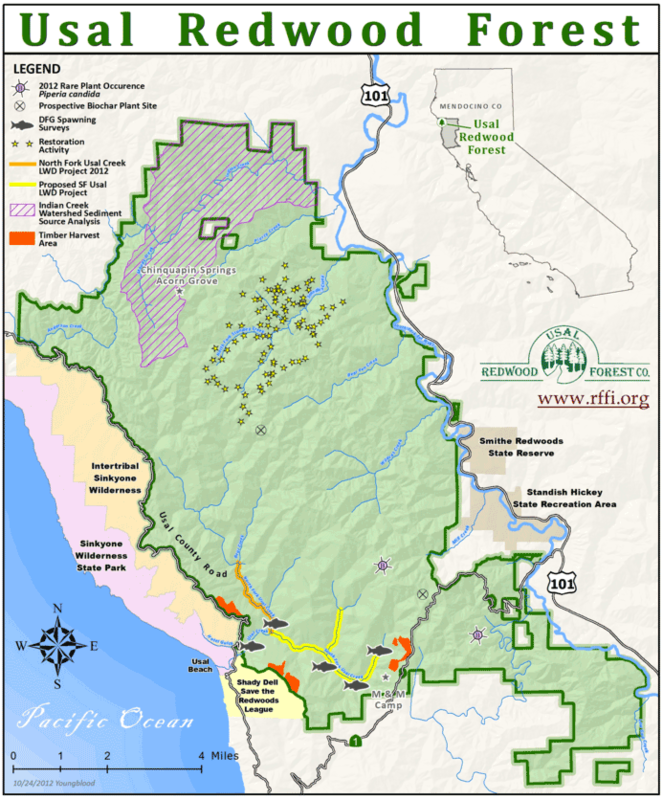 RFFI has partnered with Trout Unlimited and Pacific Watersheds Associates and conferred with experts from UC Berkeley, NOAA Fisheries, Humboldt State University, and Cal Fire in the process. The general approach is to conduct watershed evaluation in Usal’s two major watersheds Usal Creek and the South Fork of the Eel River, one of the most important salmon spawning grounds in northern California. We are and will continue to follow up with restoration prescriptions. This is being incrementally applied to the whole of the Usal Redwood Forest. This grove will be used for acorn gathering by local Native Americans. In July 2010, tribal peoples from all over California were invited by RFFI and the Wailaki Tribe Corporation to share in a tour of cultural restoration and native plant gathering. Visitors came from all over California to Usal Redwood Forest to learn about this project and to offer advice. Ron Lincoln, elder of the Wylaki Tribe, points to one of the large Chinquapin trees in the grove that gave birth to the name of the Chinquapin Springs Acorn Grove. 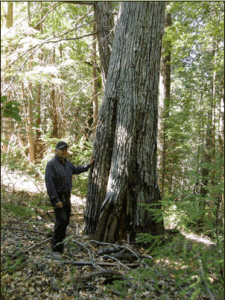 Community engagement is a cornerstone of the Usal Redwood Forest (URFC) and its parent organization, the Redwood Forest Foundation, Inc (RFFI). The unique governance structure provides diverse perspectives. geographically and in terms of interests and expertise. The Usal Redwood Forest is a sustainable working community forest. Over time, RFFI has engaged the community in planning for: forest management; controlling Tan Oak/ use of herbicides; biochar and uses of excess woody biomass; access / recreational use of the forest; cultural /Native American uses of the forest; the conservation easement; development; and future disposition of excess revenues. RFFI has engaged more than 450 residents in helping to develop recreation plans to address public enjoyment of the Usal Redwood Forest while minimizing the danger and negative impacts of unmanaged public access. The 2011 sale, long-term planning, and work with the Save the Redwood League is providing public access to Shady Dell. Working with an organization that has the structural capacity to address the many aspects of user safety, trail maintenance, interpretive signage, liability, and user amenities has made it possible to open up an area of unique beauty to the public. “Mother of the Forest” by Michael Bagdonas. 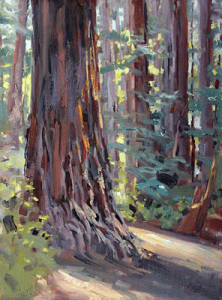 From “Paint The Forest,” a nationwide juried art and photo competition. The Art Contest captured both the beauty and plight of our nation’s forests and was endorsed by the United Nations. Paint the Forests engaged thousands of participants and observers across the nation. 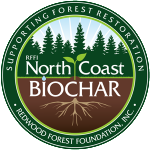 North Coast Biochar is a fledgling commercial operation of Redwood Region Renewables, LLC, a subsidiary of the Redwood Forest Foundation. The operation evolved from the highly successful, grant funded Biochar Demonstration Project (BDP). The BDP involved a complex partnership, including the Redwood Forest Foundation, Inc. (RFFI), Usal Redwood Forest Co. (URFC), Mendocino County Woody Biomass Working Group (WBWG), Humboldt State University’s Schats Energy Center (SERC), Redwood Renewables, LLC, and New Island Capital. The parties are working to improve forest health through the utilization of excess forest biomass for the production and sale of North Coast Biochar, an ecologically sound, sought after soil amendment. North Coast Biochar is a fledgling commercial operation of Redwood Region Renewables, LLC, a subsidiary of the Redwood Forest Foundation. The operation evolved from the highly successful, grant funded Biochar Demonstration Project (BDP). The BDP involved a complex partnership, including the Redwood Forest Foundation, Inc. (RFFI), Usal Redwood Forest Co. (URFC), Mendocino County Woody Biomass Working Group (WBWG), Humboldt State University’s Schats Energy Center (SERC), Redwood Renewables, LLC, and New Island Capital. The parties are working to improve forest health through the utilization of excess forest biomass for the production and sale of North Coast Biochar, an ecologically sound, sought after soil amendment. Producing biochar is highly congruent with RFFI and URFCs commitment to the “Three Es” (ecology, economy and equity). The excess biomass is removed in an environmentally sound manner preserving wildlife habitat, releasing desirable conifers, supporting RFFI’s non-herbicidal vegetation management policy, reducing the risk of catastrophic wildfires, and producing biochar that reduces water & fertilizer use and sequesters carbon for hundreds of years. RFFI is currently developing a plan and seeking financial support to transition the Biochar Demonstration Project to a viable commercial operation. North Coast Biochar offers the region a synergistic opportunity for sustainability. RFFI has conducted studies on the areas, including archaeological studies by the State Archaeologist. Usal had been used historically by local native peoples for these same purposes. The State archaeologist identified a location in which no existing Native American artifacts will be disturbed. Focus on all cultural uses such as reed and medicinal plant gather in addition to acorn gathering. Most significantly they see the opportunity for the forest to act as a catalyst to bring tribal people together to teach cross-cultural respect for the land and educate youth in traditional tribal ways. Community engagement is a cornerstone of the Usal Redwood Forest URFC and its parent organization, the Redwood Forest Foundation, Inc (RFFI). The unique governance structure provides diverse perspectives. geographically and in terms of interests and expertise. The Usal Redwood Forest is a sustainable working community forest. Over time, RFFI has engaged the community in planning for: forest management; controlling Tan Oak/ use of herbicides; biochar and uses of excess woody biomass; access / recreational use of the forest; cultural /Native American uses of the forest; the conservation easement; development; and future disposition of excess revenues. RFFI has engaged more than 450 residents in helping to develop recreation plans to address public enjoyment of the Usal Redwood Forest while minimizing the danger and negative impacts of unmanaged public access. The 2011 sale, long-term planning, and work with the Save the Redwood League is providing public access to Shady Dell. Working with an organization that has the structural capacity to address the many aspects of user safety, trail maintenance, interpretive signage, liability, and user amenities has made it possible to open up an area of unique beauty to the public. URFC, RFFI and a coalition of Native Americans have jointly conducted research and forest restoration that made it possible to establish the Chinquapin Springs Acorn Grove for acorn gathering by local Native Americans in 2012. RFFI and the Usal Redwood Forest Company celebrate their work annually with a large community Annual Meeting and Barbeque. They conduct periodic tours and continue to work with the community and other interested parties to develop plans for additional community access within the context of our forest planning process. Finally, we communicate and solicit input through our biannual newsletters, Annual Update and frequent informative eBlasts. Sign up for our newsletters!